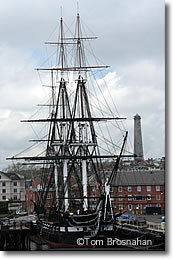 Bunker Hill and the USS Constitution ("Old Ironsides") are the reasons to visit Charlestown. North of the tip of the Boston peninsula, across the Charles River, is the mostly-residential district of Boston called Charlestown (map). Landmarks: look for the Bunker Hill Monument at its highest point, and on the riverbank in the Charlestown Navy Yard (also called the Boston Naval Shipyard), the tall 18th-century masts of the USS Constitution ("Old Ironsides"). If you visit Old North Church in the North End, walk uphill to the old burying ground (cemetery) and look across the water to see Charlestown, marked by the Bunker Hill Monument, with Old Ironsides in the water below. The USS Constitution is 2 miles (3.2 km; 42-minute walk) north of Boston Common, or 1.5 miles (2.4 km; 30-minute walk) north of Faneuil Hall Marketplace. You can take the MBTA Orange Line subway to the Community College station in Charlestown, then walk a half-mile (800 meters, about 12 minutes) northeast up to Bunker Hill. Bunker Hill Monument, Charlestown (Boston).